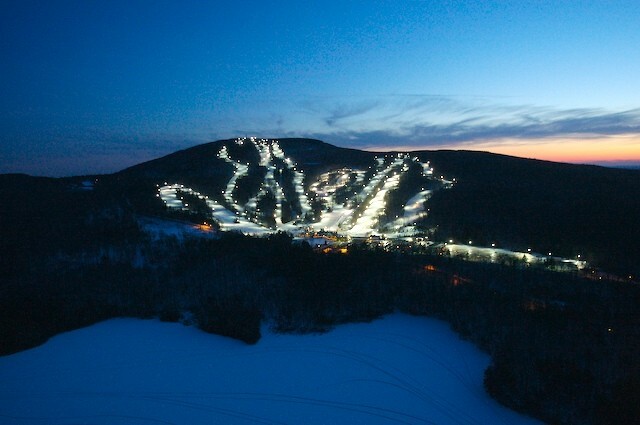 Wachusett (Algonquin for "great hill") has day and night skiing on its runs. Among the many lifts serving the mountain, you will find a high-speed detachable quad. Terrain accommodates advanced, intermediate, and beginners alike, and boasts a vertical of 1,000 feet. Skiers and riders have access to 110 skiable acres, 26 trails and 8 lifts. Uphill capacity of more than 9,200 skiers per hour is made possible by 3 high speed quad chairs. Base lodge, cafeteria, snack bar, coffee bar (a newly-enlarged Starbucks counter), restaurant, and two lounges. The Waffle Haus - an outdoor food outlet specializing in Belgian waffles, is a local favorite. Full service shop with demo center. Rental shop, ski and snowboard school with 200+ instructors. State-of-the-art "BYS" system designed to drastically shorten fit time in rental shop. Children's center with nursery and children's ski school. Shuttle service to Wachusett Inn. One-hundred percent snowmaking. Get Snow Reports, Powder Alerts & Powder Forecasts from Wachusett Mountain Ski Area straight to your inbox!